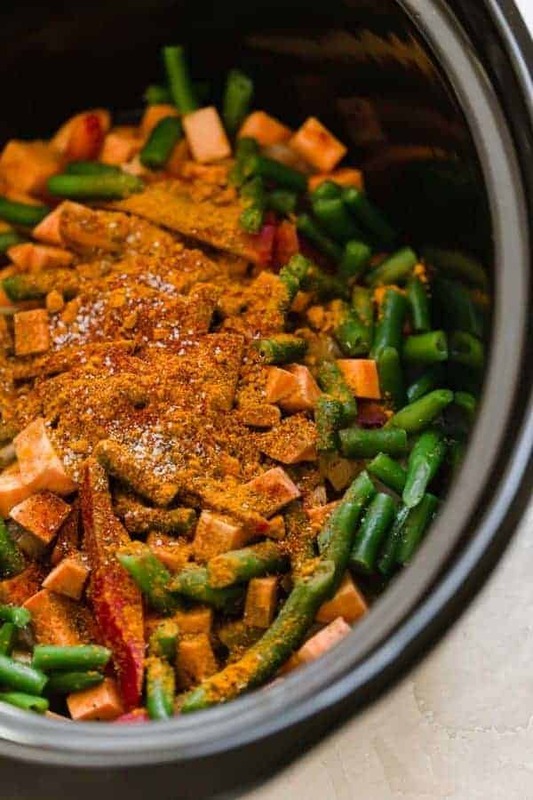 Sweet potato, tender chunks of chicken, red pepper, and green beans all slow cooked and infused with an Indian-inspired spice blend, make this Slow Cooker Sweet Potato Chicken Curry heaven in a bowl. This scrumptious bowl of Slow Cooker Sweet Potato Chicken Curry will warm you right up on a cold day. When the temps drop and the air becomes frigid, I crave warm, hearty bowls of soup, stews and slow-cooked meals. And this Slow Cooker Sweet Potato Chicken Curry is sure to warm you right up on a cold day. It’s a stew-like dish that’s incredibly flavorful and has everything you need in a meal – quality protein, healthy fats and veggies. Comfort food + slow cooked + easy peasy = a recipe you’ll surely love. I’m all about ease and convenience. In fact, in 2019 our focus for the blog is to share recipes that are easy, made with simple ingredients, meal prep-able and classic comfort food turned healthy. We know these are the kinds of recipes you love and we want to do our best to serve you and your family. We want to help you spend less time in the kitchen so that you can spend more time around the dinner table and/or doing the things you love most. Slow Cooker Sweet Potato Chicken Curry fits the bill. 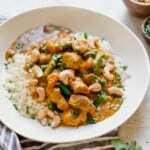 It’s an easy set-it-and-forget-it recipe, it’s made with simple ingredients that you can find anywhere and it’s a one-dish meal, so clean-up is quick. In addition it’s meal prep-able and freezer-friendly, too! You can also make this recipe in an instant pot. Serve it over cauliflower rice or a handful greens for a delicious Whole30 option and an easy way to add in more veggies. My favorite way to serve Slow Cooker Sweet Potato Chicken Curry is over a bed of sautéed cauliflower rice. It’s a great way to sneak in more veggies. I’ve also served it over a bed of greens when I didn’t have cauliflower rice on hand. If not on a Whole30, feel free to serve it over white or brown rice if you wish! And don’t forget to top with roasted cashews for added crunch and fresh cilantro. 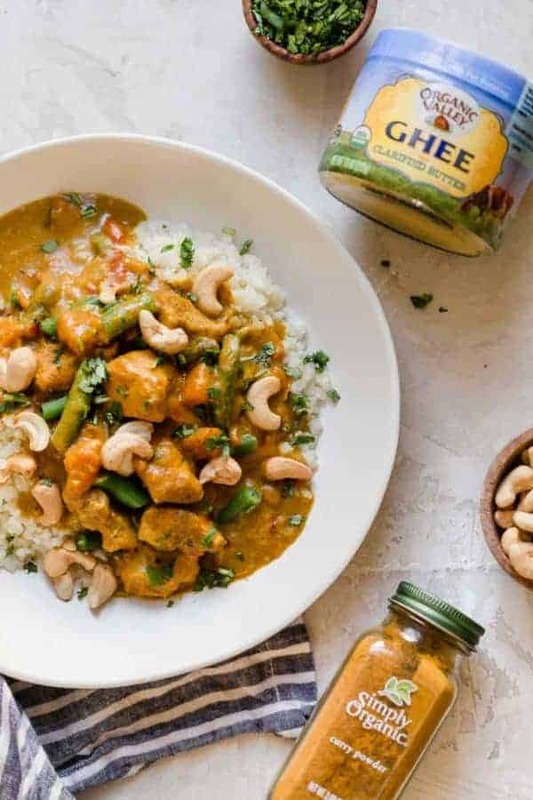 For the love of curry – a must try flavor! Curry is a favorite flavor of mine. So much that we have shared several curry inspired recipes on the blog such as: Curry Egg Salad, Cauliflower Curry Hummus, Instant Pot Lamb Curry, and Curry Chicken Salad. Yeah, I like curry! I think some people are a little hesitant in trying it because they’re just not sure what to expect, but I highly recommend you do. If you don’t want to purchase a whole jar of it, head to your local food co-op or Whole Foods and purchase just what you need in bulk. What are the spices in curry powder? 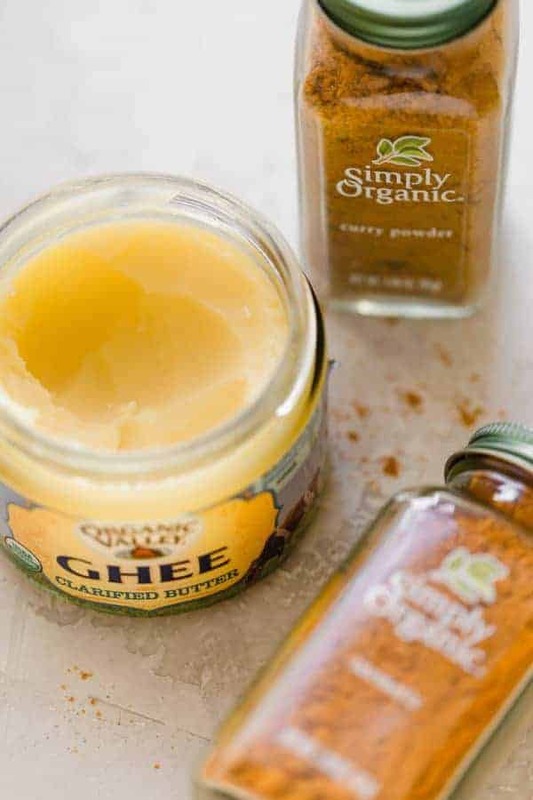 Curry is an Indian-inspired spice blend that is commonly made with coriander, cumin, turmeric, ginger, dry mustard, black pepper, cinnamon, cayenne and cardamom. You can find a homemade curry powder recipe here. 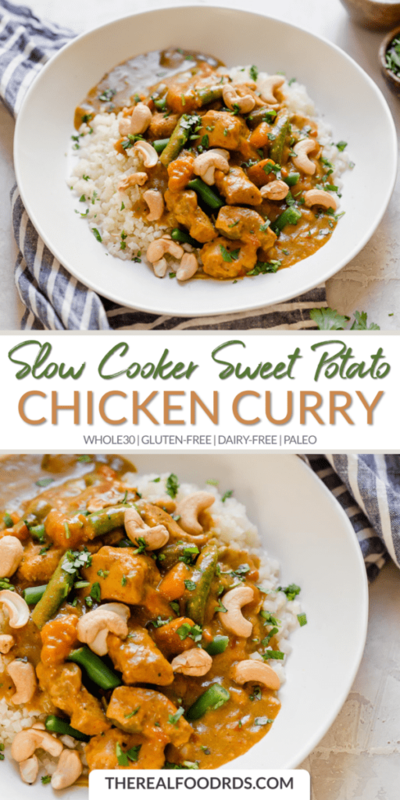 I can’t wait for you to add Slow Cooker Sweet Potato Chicken Curry to your menu and give it a try! I hope you enjoy it as much as I do. 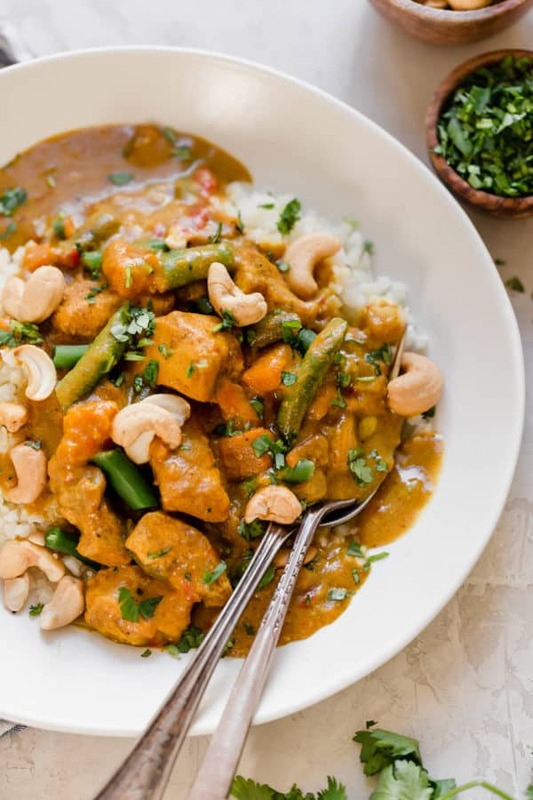 Slow Cooker Sweet Potato Chicken Curry is heaven in a bowl. 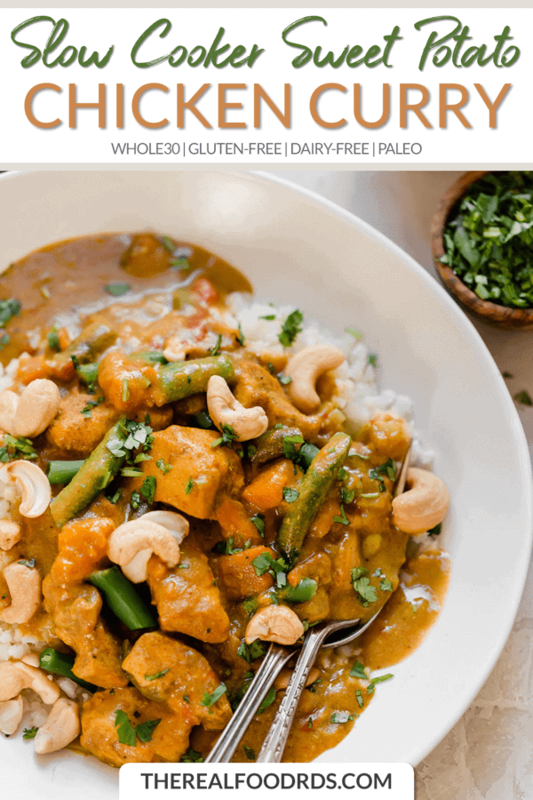 It’s Whole30-friendly and infused with a flavorful Indian-infused spice blend. In a small pan over medium heat, add the ghee, diced onion and garlic. Sauté until onions are translucent. Previous articleMedical News Today: How do relationship breakups impact physical activity?